This burial place contains the tombs and graves of some notable historical figures who witnessed various eventful periods in the history of Seychelles. 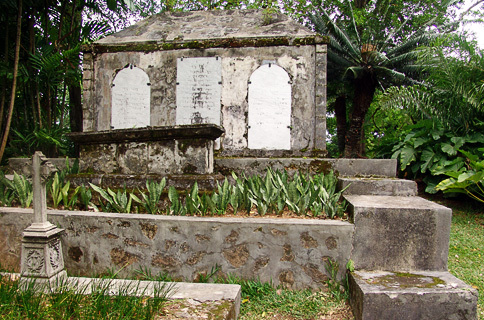 The most prominent grave is the limestone sepulcher of Chevalier Jean-Baptiste Queau de Quincy (1748-1827), Commandant and Civil Agent of Seychelles from 1793 to 1811 when Britain took possession of the islands. Born in Paris in 1748, he worked in the household of the future Louis XVIII and then in 1770 joined the French army in India where he became an officer in the Pondicherry regiment. Before coming to Seychelles he was Commander of the Grande RiviÃ¨re region in Ile de France (Mauritius). Admired for his steadfastness of purpose and sagacity, he negotiated the conditions of the first capitulation on 17th May 1794 with such diplomatic shrewdness and bravery that hostilities between the British and the French were forestalled. At that time the population of Seychelles consisted of 317 French, 86 free blacks and creoles and 3015 slaves mainly of African and MadaÂ¬gascan origin. The terms of the first capitulation were such that QuÃ©au de Quincy remained as Commandant even if the Seychelles had become a British possession. Consequently, he devised a stratagem that he used until the final capitulation in 1811. It enabled him to receive French vessels that arrived for repairs and provisions and at the same time avoided a military confrontation with the Royal Navy. Each time a French vessel appeared he would hoist the French Tricolour and when he saw a British vessel he would fly the Union Jack! In 1811 when the British appointed Bartholomew Sullivan as Commissioner, Jean-Baptiste Queau de Quincy was given the post of Juge de Paix (Judge of the Peace). He was made a chevalier of St. Louis in 1815. He died in 1827 at the age of 79. His second wife Marie-Joseph Dubail whom he married in 1794 rests beside him. She died in 1809 at 38 years old. A 6-year-old child, Isidore Henriette Roselmie Lefebvre de Maccy is also buried in the sepulcher. She died in 1828. Some British chief civil commissioners are also buried here, namely William Hales Franklyn who died in 1874 aged 58 years, Francis Theophilus Blunt who died in 1882 at 43 years old and Governor John Kingsmill Robert Thorp who drowned at Grand Anse on 13th August 1961 together with his financial secretary. The last person to be buried in the State House cemetery was Former President of Seychelles, Sir James Richard Marie Mancham, who was Seychelles' first President following his passing on 8th January 2017. His State Funeral was held on 12th January 2017 with full military honours.